As Laura and I mentioned before, we are famous. 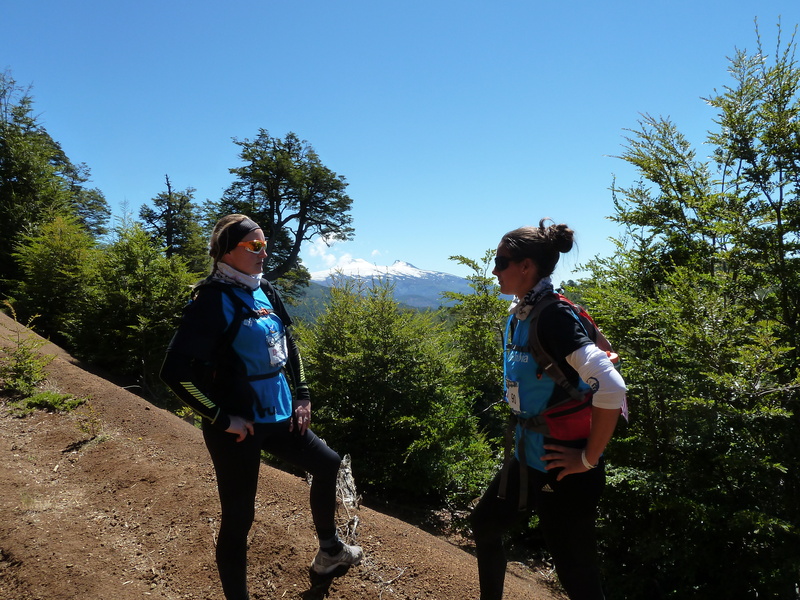 We were interviewed by ESPN before starting Cruce and then again after crossing the finish line. It’s taken me a while, but I’ve finally edited it so that our shining moments can be seen. The entire episode gave me goosebumps, but due to copyright I can’t upload the entire thing. Also, I apologize for the poor quality. I’m not too tech savvy and ended up putting my camera in front of the TV as I couldn’t come up with a better idea. It’s quite a feeling running from one country to the other. In the middle of nowhere. With some weird energy that, after being so tired just hours previously, you have no idea where it comes from. The sun was shining and Maria and I were on a roll. We were passing familiar flags and faces and there was definitely a lot more banter going on between everyone. The end was near and people could feel it in their hearts, in their minds, in their legs. The route had been cut by a few kilometres after the previous day’s never-ending 41km which had turned out to be a teeny tiny lie. 41 kilometres? joked those with GPS, powered by their superior knowledge. I heard someone say they had clocked over 46km. Whatever. It was far. So here we were with our bodies being strangely satisfied by our running. We took a turn and ran over a bridge into a national park with some twisting paths through the forest. We waved at those lazing on the shore fishing, drinking mate, sunbathing. The sun beat down on us and through the trees the lake shimmered. We knew that when our path came to that body of water we were nearly home and dry. It was interesting on the way to see a tactic that quite a lot of the mixed teams employed that day. Imagine: man in front with all the weight on his back and holding a pole behind him which, at the end of it, was the woman basically being pulled along to keep pace. You got the sense that not all the couples were doing it for pace and timing. Some people seriously needed to be pulled to the end. I remember that as the path worked its way down towards the water and the small cabins dotted on the lake Maria and I were talking all the time. I remember some chat about a film, but can’t for the life of me remember any details because the overriding memory is one of joy and adrenalin. We hit the flats and started going for it, bouncing along the grass and the stones on the shore. The lake curved round to a point where it almost enclosed, but there was a short waterway which we would have to cross in canoe or boat. We strode out, passing more familiar teams, feeling a surge of power and pride. “You there?” “I’m here.” We bounded towards the line. The finishing line for the timer chip wasn’t the true, glorious end. It clocked us in, and we jumped over it together. Home. People seemed a bit bewildered. What? Is that it? Have I done it? You have. Smile. We then had to queue on that windy shore to get over to the other side of the lake and make our last steps to the finish. Unfortunately, the race organisers stopped the use of the canoes as it was really windy and they were inflatable. If we’d had to row, we would probably have ended up back in San Martín. So, we jumped into other boats and skimmed across the water to the woods on the other side. And then it was time. Hearts were pounding. We had ignored all the negative talk we’d heard in the boat queue and were ready for our grand finale. M&MRC was coming home. We got our flags out, put our fleeces away and put our packs back on. There was a big, inflatable finish line to cross with cameras and claps and we were ready for it. I briefly though back to the first finish line on Day 1 and how it had taken forever. But now our legs needed no persuading. We dipped through the trees and came to a clearing, where someone pointed us to the left and then we saw it. The field opened out and our triumph was metres away. We opened out our flags and took each other’s hands. Smiles spread on our faces and as the crowd saw us coming so the cheering and clapping started. We will never forget those last 100 metres. It’s hard to forget the thousands before that; but the culmination of such physical and mental effort, the end of such an incredible experience and the success of our adventure were all written in the grins of our faces as we crossed the line. In the euphoria there were huge hugs, photos with the official photographers, photos with friends who had seen us cross, another interview with ESPN. There was the handing in of the timer chip, the receiving of our medals. There was meat and chorizo, there was sun and sitting on the grass. There was cheering and clapping for those that followed us over the line. It’s always sad when something amazing comes to an end. But not when it’s an adventure that ticks all the boxes: friendship, beauty, nature, adversity, triumph. These adventures stay with you a lifetime; in the memories made and the things you learn about yourself and others. 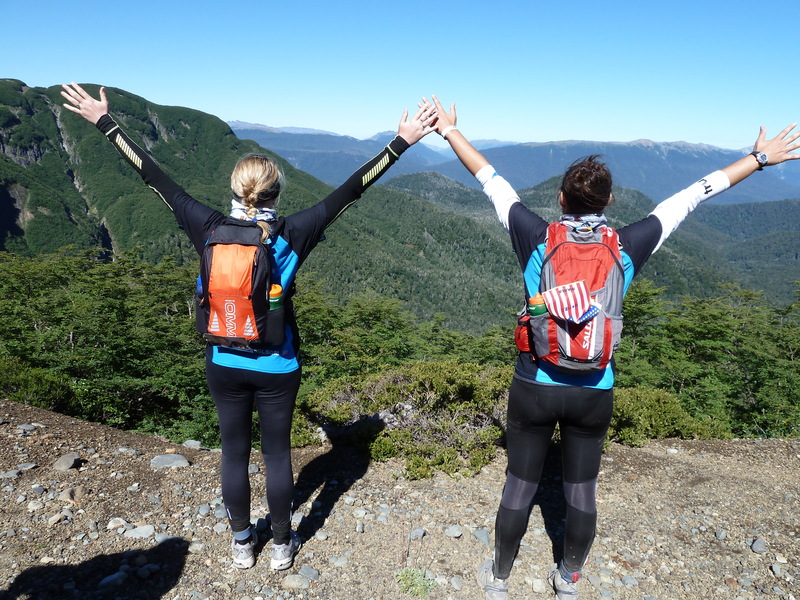 On the way back to San Martín de los Andes all I could think about was the past four days and how they had fired up even more love in me: for this part of the world, for running and adventure and for my friend dozing next to me on the minibus. For there is no one else I could have crossed that finish line with. She is the Maria, the Mondonga, the Mad, the Marvellous of M&MRC. And if there is another finishing line like that one, no doubt she’ll be there again for More. I peeped one eye open to see what was going on in the kitchen. Before the sun had peaked over the horizon, the woman that had so kindly let us sleep on her floor was up and working the dough. She hadn’t slept more than 3 hours, but she and her children we’re making dozens and dozens of bread for the runners. We slept a couple hours more until the alarm sounded at 7 am. We stretched our legs and were pleased to not feel every inch of muscle as we had the previous day. We gathered the few things we had and made our way back to camp. People were already bustling about. There were bags everywhere; ones that still needed to be claimed and others that had been returned to pass customs and enter Argentina again. We hunted ours down and made our way to the tent. We changed, reunited with Equipo 86 and made our signature peanut butter on toast for breakfast. The best part of not having our bags the night before was there was no need to repack. Our sleeping bags were still tightly wrapped and we just needed to pull a few things out to prepare ourselves, including our passports. We turned back in our bags and headed to the port-a-pots one last time. This was the last day and we were getting a real starting line with a staggered start on the beach. As we neared the sand, we saw Reyes and Ortega (the winners that floated across the rocks) on their way. We cheered as Equipo 86 passed us and watched the 100s of men pass before we made it to the beach. The mixed groups were up next and then it was us, the female groups. We waited patiently for our turn and danced as the DJ on the shore played music to pump us up. We counted down as the clock neared 0:00. We were off! Day 3 was 13 miles and after what we’d been through the first couple days, this was a piece of cake. The day before Laura had said, “I wonder how long it will be until we run normal again.” Granted we weren’t running completely normal, but we were much better off than the previous day. We worked our way along the dirt road. Up and down the hills, but these were nothing compared to where we’d been before. 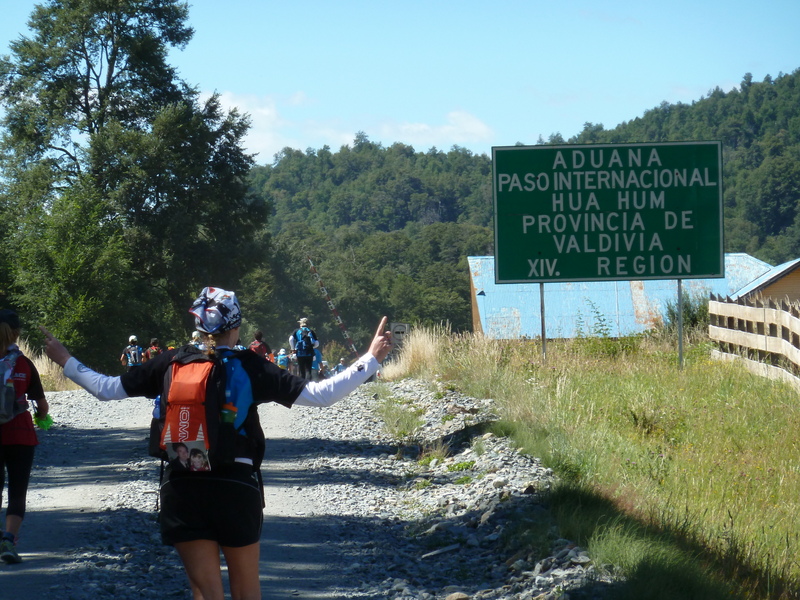 We used the trail to our advantage and quickly came upon the Chilean border crossing. As we approached we saw a line and thought it was going to take a while. We checked the watch to see how long it would take…in and out in 5 minutes. That has to be a record! 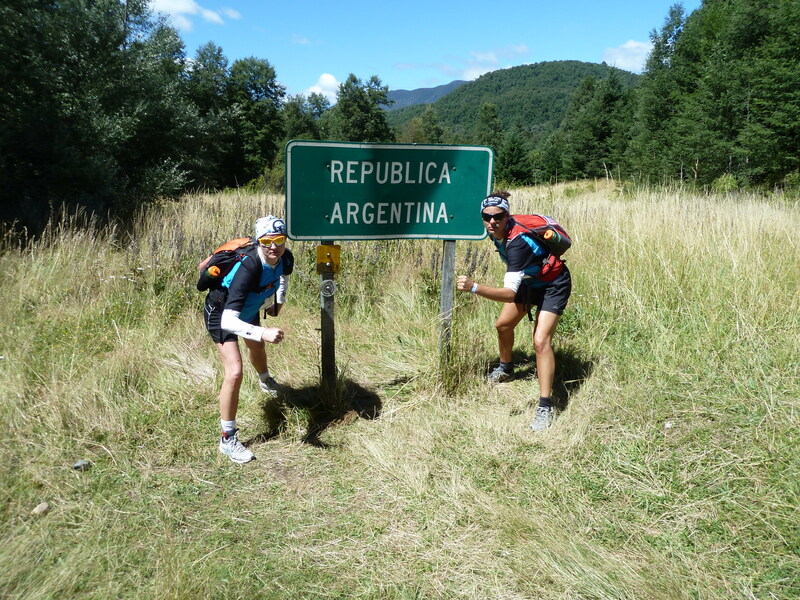 We went a couple more miles before reaching the Argentine border patrol. They had desks on the street to welcome us back and make our entrance that much easier. I slapped down my document and the official pulled out the last form left. No need to verify anything. They opened Laura’s passport to give her a stamp, but we were still moving again in less than a minute. Everything we had put in over the past 2.5 days as coming to its culmination. We were that much closer to the finish. The feeling of crossing that finish line, after 10 hours on the move, wet and aching, tired but oh-so-happy, was unbelievable. We had done it. In those final metres we were laughing; we had no idea why or at what. We were talking some kind of crazy language only we understood. The photographer was slightly bewildered and afraid of our euphoria. We were destroyed. I would like to say we walked, but we stumbled off the beach in jubilation. 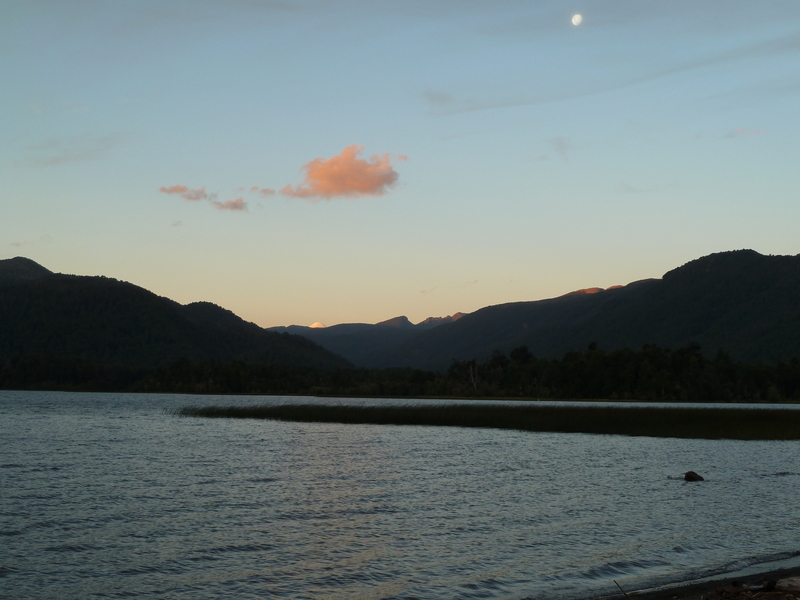 The lake behind us was still bathed in the last rays of the day; the sky was pearl blue and the moon sat squarely above the mountains, gleaming brighter with each passing minute. The campsite was in a large field right next to the beach. Rows and rows of bright blue bugs greeted us again. Home sweet home. No there’s not. They were for the workers. We wandered further into the mayhem. Well, mayhem in slow motion. People were hobbling, dragging their packs, sitting on the grass wrapped in warm clothes and survival blankets looking, above anything else, totally worn out. We picked up a chorizo and bread on the way to find our bags. They hadn’t arrived. The large boat that had transported us to the first camp two days before had broken down, and instead there was a tiny boat being used to transport everything down the lake. As that morning we had had to put our packs in piles according to the previous day’s times our bags were not a priority. And, true, we had arrived six hours after the leaders of the pack. But still. We were wet. We were dog-tired. We were hungry. Dry clothes, warm clothes, cutlery and plates, torches and sleeping bags: all these were in our backpacks. We decided to sit by the fire and get warm. Ah, what pleasure it was to take off those wet trainers and socks and toast our toes by the crackling flames of the fire. Darkness had descended and we sat boggled-eyed staring at the fire’s glow. Maria went for another chorizo. Then we heard it. Your bags will be arriving between 12 and 1am. We looked at each other. It was nearing 10pm. The temperature had dropped. We now understood why people had run in that sweltering heat with fleeces strapped to their packs. We also knew that information was a lie. 1am meant 3am. We had lived in Argentina long enough. We understood that. Two shadows cast over us. “Chicas! Equipo 90!” It was José and Gonzalo, our neighbours and saviours of Equipo 86. It had been a tough day for them too, but they had arrived in plenty of sun and sat on the beach with mate awaiting our triumphant arrival. The wonder of crossing the line, however, had now passed. We sat and considered what to do for the night. Equipo 86 came into their own, lending us dry socks, plates and cutlery, handing us fleeces and jackets. They kept our places by the fire as we went to fill our bowls with pasta. With each forkful the need to lay horizontal and be warm intensified. More news came over the loud-speaker. Some people were being offered a trip to San Martín de los Andes for the night in a hostel. A warm shower and bed seemed like an amazing option. But we had driven that road two days ago. It was a long trip. By the time we got there and found a bed for the night, we’d have to come back for the start of the third leg. And what about our passports? They were in our backpacks. Would we be let out? Would we be let back in? We knew we had to make some kind of decision soon. Then José told us about a cabaña that had been mentioned earlier (way before we crossed the line). He went to investigate as we shoved spaghetti into our mouths. A dry and warm bed, here in this tiny village? Too good to be true, surely. Why wasn’t everyone there? He came back. We were going to the cabaña, regardless if we were on any list or not. Equipo 86 thought they knew where it was. 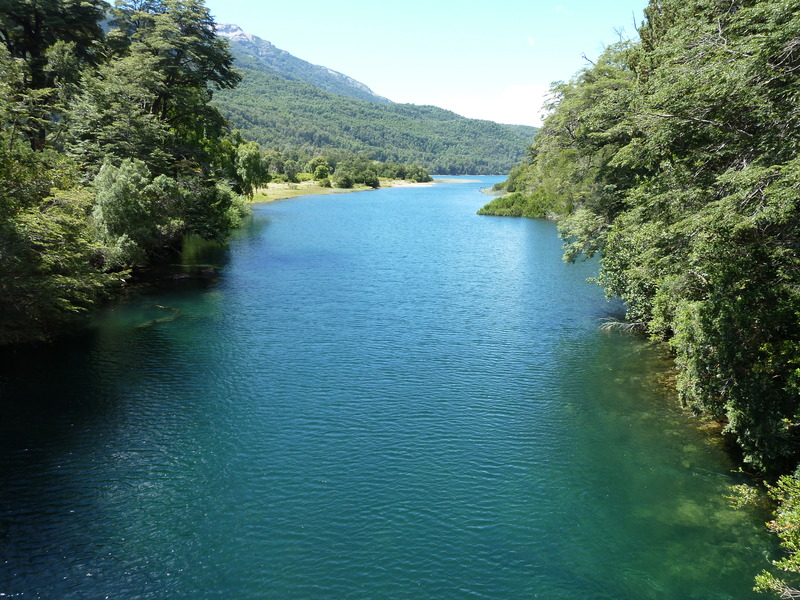 It wasn’t as if you could get lost in the village: one way was forest and the Argentine border; the other the lake with a tiny boat working its way back and forth all night. Anything resembling a cabaña was in total darkness. There was only one light on in the village and we headed to that door. The heat that hit us from inside was wonderful. Smells of coffee and bread greeted us. It was a tiny kitchen, which we learnt made the bread rolls for the village. All the lady could offer us was a couple of inflatable mattresses and some blankets. Would that be all right? Sounded like heaven to us. José and Gonzalo left us to it, as the lady’s sons brought mattresses out and laid them on the floor in front of the mud oven. We kept looking at each other, shaking our heads in disbelief. We were inside; dry and warm, with snug clothes, a better bed than we would have had in our tent and a working toilet. This was 5-star luxury. I laid down as Maria helped a woman find her contact lens. Another couple had arrived and found the kitchen shelter for exhausted runners. We were happy to share. Even in extreme tiredness, relief buzzed around the room. I tried to move my legs. They were stuck, already sleeping. The stars out of the window next to us pulled us towards sleep as well, and we were rocked by the lady’s kindness, the smell of baking and warmth of that oven all night long. Another warning we had received was that the downhill could be just as challenging as the uphill. 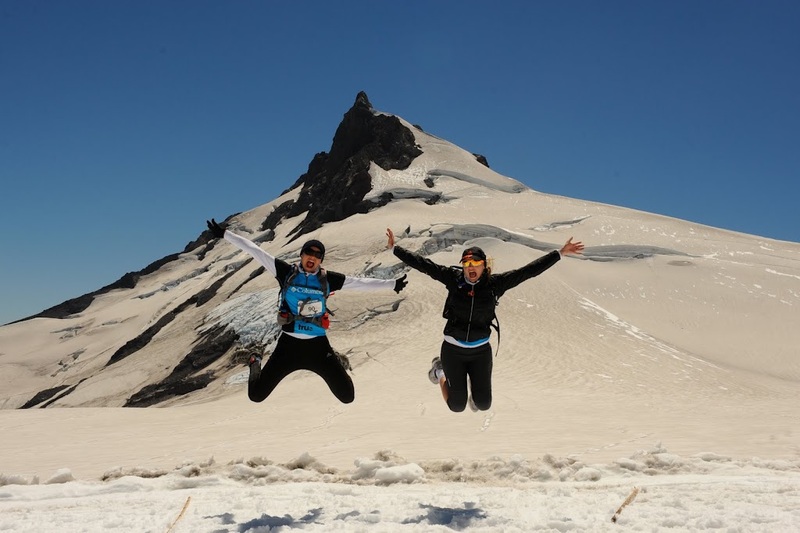 The day before we’d run most of the declines as our blood was pumping with so much excitement from the views on top of the volcano and the run through the snow. Today was a different story. The sensation we felt in our legs with each step was something we’d never experienced with such intensity before. We worked our way down the switchbacks and played what seemed like games with other runners as we passed each other again and again. It felt like it was never going to end. Earlier in the day, we’d made comments about it being next to impossible to move at the pace according to the distance markers we were given by volunteers and other people’s GPS. Finally, it seemed as if we were getting closer. We crossed a couple streams, which meant we were nearing the lake. And then we had a more definite answer. A volunteer informed us that we were meters from the shore and only 2 kilometers stood between us and the finish line. We arrived to an incredible view. The lake we had crossed earlier in boat to get to Camp 1 laid before us and a blue speck could be seen in the distance. It was the finish line with the arch and clock. Two runners before us were already being helped into the water as the only way to finish was through waist-high water and along the beach. Then a voice was heard through the volunteer’s walkie-talkie. The race medic wanted to end the race. 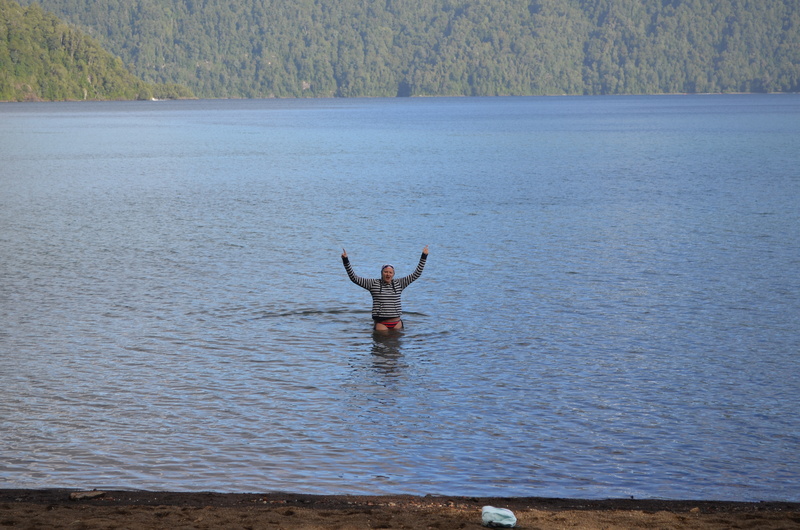 There was too much risk of getting hypothermia to continue allowing the runners in the lake. The course was to be closed and runners would be bused to Camp 2. I’m sure you can imagine the fury. We hadn’t put in so much effort in the past two days to be disqualified. Slowly more runners accumulated at that spot while the young volunteer tried to stand his ground and convey the bad news. We argued and fought until finally someone said, “We signed a consent form so all responsibility is on us and we want to get wet.” And that’s just what we did. There were about 15 of us at that point and one-by-one we stepped into the water while bracing ourselves on the fallen tree trunks and made our way to the finish line. 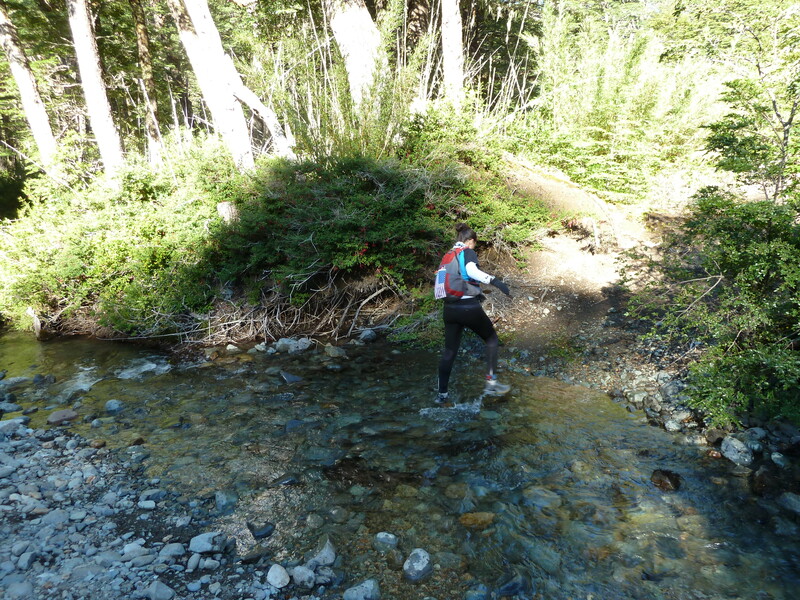 We went over trees, beside the big, slippery rocks and then the final meters on the pebble beach. It was like an obstacle course that (at least for me) was the most exciting part of the day. It made those last kilometers different and the cold water helped us forget what your muscles had been telling us all day. We crossed the finish line after 10 hours, no lunch and the sun setting over the mountains. What a day it had been, but one that can never be forgotten. Day 2 was done, which meant the majority of the mileage was behind us. We’d taken a risk, went against the doctor’s orders and got wet, but what was all that fuss about hypothermia? We had dry, warm clothes waiting for us at the camp. Right? It shouldn’t have been a surprise. We had been warned. Day two is harder than day one. We woke up the next morning, the rain had gone. So had my thighs. In the queue for the toilet, everyone was stretching out their quads this time. Some people came out of the portaloo looking as if they really still needed to go for a number two quite badly. The volcano had shot a lot of muscles. But today, there was further to go. We had come here for this: challenge, mystery… seeing how much we could take. So, our training hadn’t been in the mountains. That didn’t matter now, the super steep was over. All we had to do was keep moving. After packing up our backpacks and dumping them on the beach, we set off on the same walk through the woods to the starting point over the bridge. We would follow a brief section through the forest as per yesterday and then veer off through the green mountains bordering the lake we had boated up two days before. 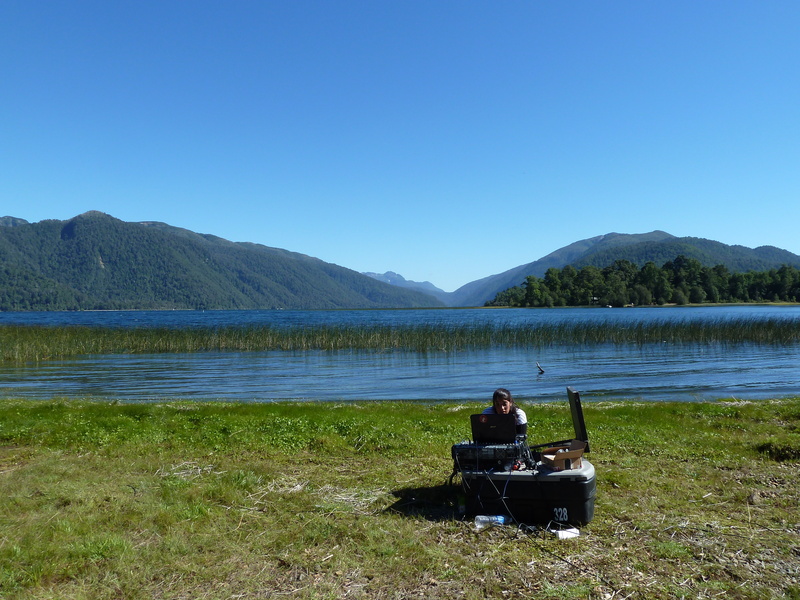 Our second camp was on the southern shore of the lake in the tiny village near the Argentine border. Just a short diversion of 40km to get there. The sun shone down on us again, breaking in golden strands through the trees. This part was undulating, but we had a pattern of jogging and walking to suit the legs. The worst bit for the thighs was the downhills. “Eee, ow, ooh, ahh, heee, uhh, ouch!” were the acoustics to the downhill steps. We happily ran the flats. “It’s actually easier to run once you get into a rhythm,” Maria said and I agreed. We left the forest and hit some open countryside. Green mountains encased us as we jogged on dirt tracks through gold and jade fields. Behind us rose the previous day’s challenge, that majestic volcano. With each step it became some far away land we had dreamt of. We passed a llama farm; we stopped at streams to fill up on fresh, cold water. The sun beat harder. People passed us and we passed others with fleeces tied to their packs. “Why would you run in this weather with a fleece?” I asked. “Completely stupid,” Maria agreed. After a couple of hours, the track started to point upwards. This was the climb we had had to save ourselves for. We were now back among the trees and couldn’t see anything beyond the next curve. Lining the route were flowers bursting with bright orange and yellow colours. Above us birds sang. They could see our route. We knew nothing of what was ahead. “Anyone got a GPS?” This was a dangerous question. No one knew at what point it would level and we’d be going down again. 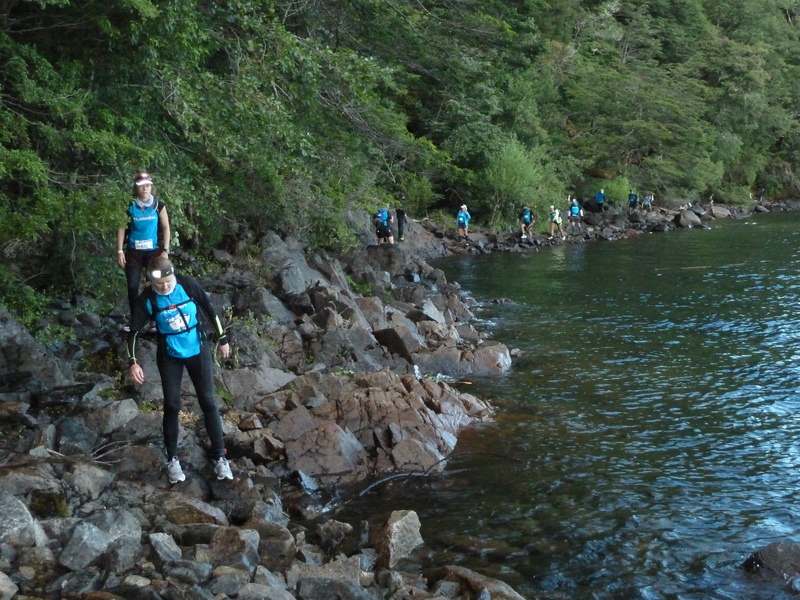 At one stream, Maria jumped down to get fresh water and I heard someone clocking 23km. We were around four hours in. Well, it can’t be much further to the top, we thought. The climb carried on, and we continued pounding up switchback after switchback, hoping to see some peak, some sign of blue bodies disappearing over the horizon. But we could see no horizon. We enjoyed the scenery: the further we climbed, the further we could out from the mountain. The lake, our home, our destination, was behind another belt of emerald mountains. Even when we hit the top, we had to get down through them. Somehow. There is a feeling you get when you are exhausted and waiting for change. It’s hope. You grasp onto any little sign that the next corner, the next moment will bring some relief. “Where is the peak?” we asked ourselves, time and again. 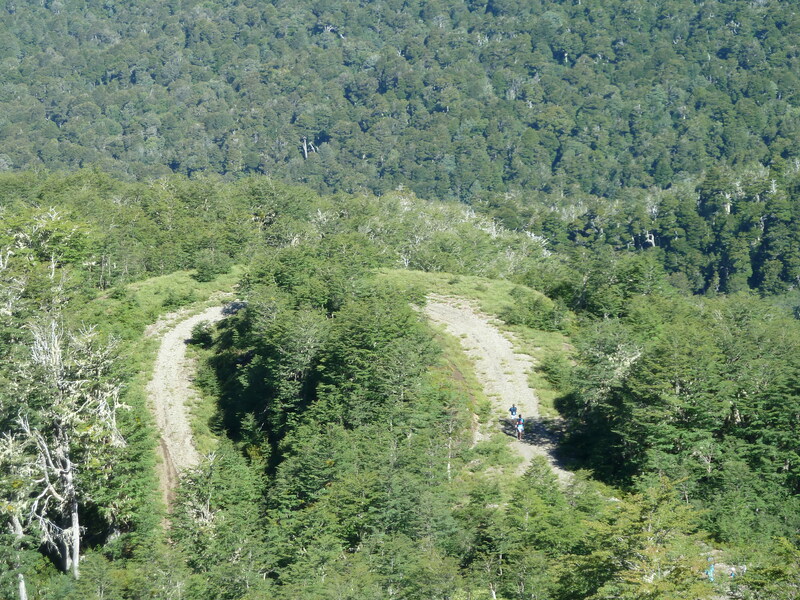 And then, high up above the trees, now above many birds, our twisting mountain track hugged the peak and opened out. Just a few more dips and rises and we would be there. It was an incredible view. In our tiredness you still had to appreciate it. 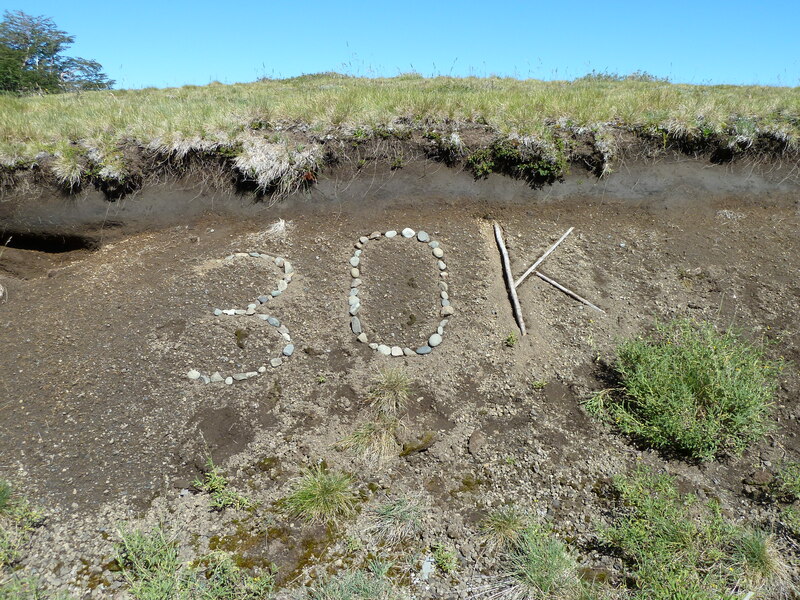 And as we hit the crest of our long and winding climb, there were those magic digits. 30km. Set into the mountainside written with stones. A wondrous sight. Hope and truth rolled into one. It was downhill from now on, still painful and uncomfortable, but a mere 10km going down after all that? Sounded like heaven. And just 10km before home? Easy peasy. We’d be on the beach in no time. We had made it through Day 1 and were on the bus back to camp. People were telling stories of how their day unfolded around us. Each of us sitting, and those unfortunate ones that had to stand, had particular events happen during the day. Some didn’t make it around the volcano as they took too long getting up the mountain, others had fallen on their way down the snow and many more were on an adrenaline high from the experience we just had lived. Laura and I chatted a bit, but we also let it all sink in. We talked some with an American girl that was standing next to us and heard about her day and before we knew it we were back at camp. We exited the bus and made our way across the sea of tents. Equipo 86 heard us as we began fiddling with our tent. They’d been back for hours, but were glad to see us back and alive. Let’s just say they didn’t have as much faith in us as we did. My goal for the day was to make it back for lunch. Lucky for us, lunch lasted until dinner so technically we made it. And after a quick bite to eat, we hopped in the lake as others had suggested that the cool water would help our muscles. So we stood for a few minutes while shivering before getting out and quickly putting on dry, warm clothes. Of course this didn’t stop Laura from singing Mr. Jones when it came on the sound system. That night a storm was coming and as we wrote before, Equipo 86 saved the day. Our tents were located at the bottom of a slope so we needed canals around the edges to make sure the runoff wouldn’t end up in our tent. Meanwhile Laura was in charge of packing up our things as we had to turn in our bags before heading out the next day. I on the other hand opted for another round of food and headed out for dinner. The rain hit and our beds (or rolling mats) were calling our names. No more small talk for us. It was time to crawl into our sleeping bags and get some sleep. Day 2 was on the horizon and it was going to be harder than we could have ever imagined. 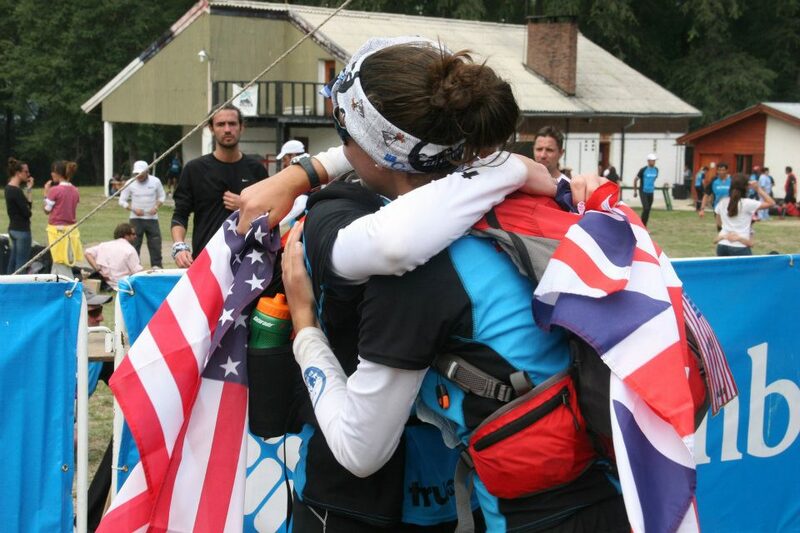 M&MRC Cruce Story #5: Where is the finish?! 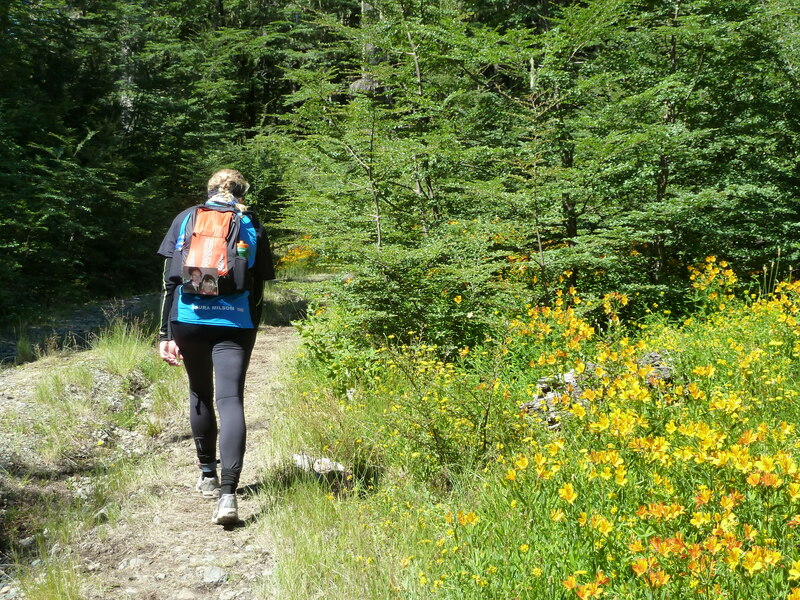 There’s total glee in your mind and body once you start going downhill after a long climb. It infects your humour, your comments, your vision, your pace. 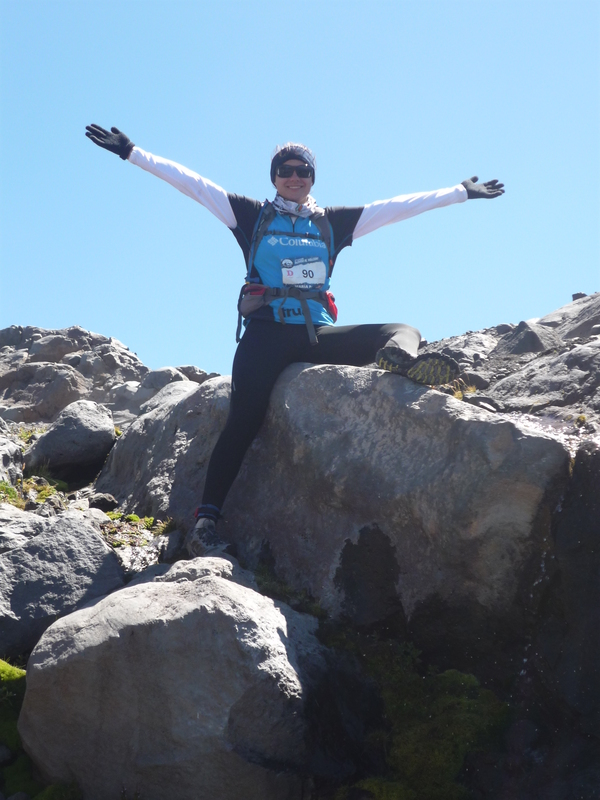 Knowing you’ve done the ‘hard bit’, you become confident, fast and jolly. Leaving the snow behind was a little sad: neither of us had ever had a running/trekking experience quite like it. And once we had got a rhythm going with our ‘trainer skiing’, it had been great. But now we were back to steep and narrow rocky paths with intercepting streams gushing between the rocks. Still, our trainers were already wet, so getting in there to fill up our water bottles with some fresh stuff wasn’t exactly a chore. The sun was still blaring and now we had the volcanoes Lanin and Villarrica in front of us, glaring majestically. After some pretty steep downhill sections, we hit the tree line again. The paths widened into what must be river beds in spring and ski runs in winter. In full-on summer, they were simply wide, stony roads for us to run. The pleasure was immense. We were passing people. We were moving fast and with every curve the forest got thicker and we got lower and lower. I lost my flag. In a toilet stop in some prickly trees, I lost my flag. I didn’t realise until another runner asked where I was from, which meant there was no flag flying behind me to tell her. One of those spiny branches had nabbed it. A British flag with my name on it will lie stuck in those trees on that volcano for a while to come. That’s an OK feeling. More downhills followed and we ran a lot. We started to recognise parts of the path we knew we would rejoin at some point to get back across the bridge. How many hours had that been ago? “We’ve been going 8 hours,” Maria shouted. We must be there soon. “Do you recognise this?” we asked each other, running through trees laying across the forest floor which had been cut through so 1,500 runners could pass. We didn’t. Turns out we had volcano amnesia. “We’re here! Here’s the bridge!” We ground to a halt. Where was the timer chip? Where was the woman on a stool? A little confused, we thought maybe we were too late. But, surely they would have a proper finishing line? We meandered across the bridge, wanting to dive straight in to the river’s beautiful green waters below. Turning the corner, we strode up the hill we had shuffled down earlier that day, excited and nervous. Then we saw a hand in the air, it was linked to a body. One more kilometre to go! Keep going, this way! Onwards we ran, taking a fresh route back through the forest, which we also knew took us away from the camp. What were they doing? More tortuous turns? Ahead of us we saw an arch; another lady was standing under it, directing us to the right. Just 500m to go. We turned right and saw a hill. Our legs were jelly like from all the downhills. Come on then, quick march. At the top there was another turn to the left and straight ahead stood a policeman in the middle of the road, stopping the few cars there were to let us pass. We were back on the flat and started running again. Across the road, those magic words: 100 metres to go! We went as directed. Where? Where was the finish line? Now go through the car park and turn right. We kept going. This was a cruel trick. A little girl stood at the next corner, with her arm out, guiding us right again. Where was it, though? Nearly there, we were told. Where? Where is nearly there? A couple more twists and turns through the trees and we finally saw it. Holding hands we burst past a couple we had met on the boat and pipped them to the post. It felt incredible. Day one was over. How it had even started we couldn’t remember. Volcano amnesia lets you forget the pain and just remember the joy. And this was pure joy. 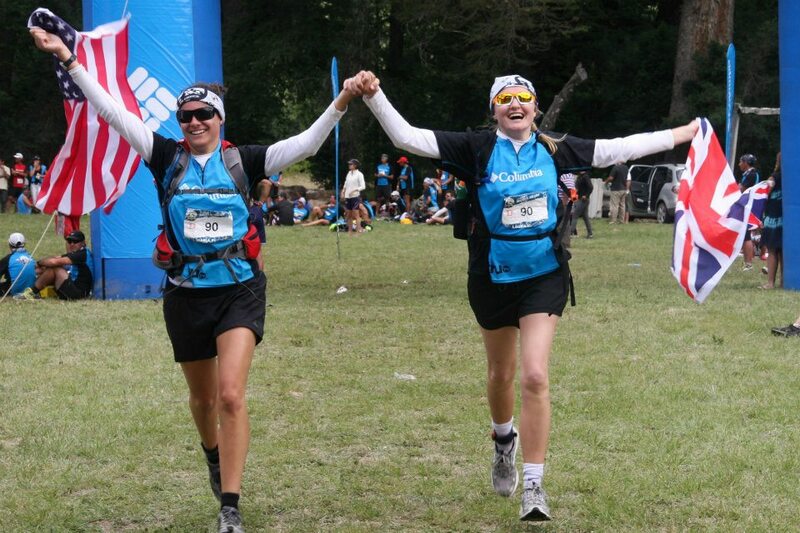 With drinks in our hands (of the non-alcoholic variety) we chatted with other finishers at the bar: the bar being the patch of grass in the middle of this Chilean forest which was our finish line. It had taken us 8 hours and 20 minutes to get there. We couldn’t imagine getting to the next bar would take that long. We continued our ascent while singing and enjoying the new surface we were trekking on. 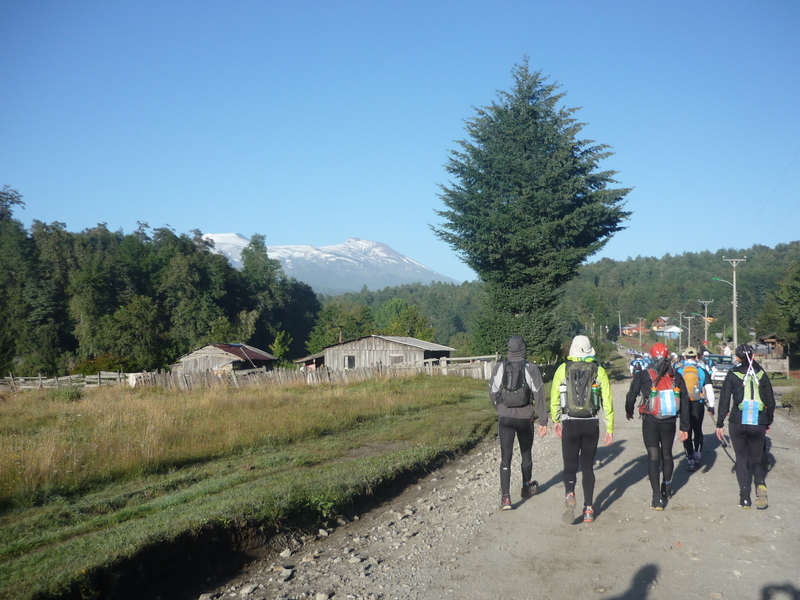 The snow was covered by a bit of ash from the Puyehue volcano, but that didn’t get us down. With each step we moved closer to the top and that much closer to reaching our goal. Not far into the snow was the first hydration station. They used snowmobiles to get Gatorade and buckets of water almost 2000 meters up the mountain. We paused to drink straight from the containers before beginning our move again. The water was ice cold, which was partly due to the cooler temperatures as we made our way up. Suddenly we saw figures to our right running their way down. How could this be possible?! We were making good time, but we were also enjoying the sights. There were others out there to win and they were already on their way to camp to make it in time for lunch and a nap. 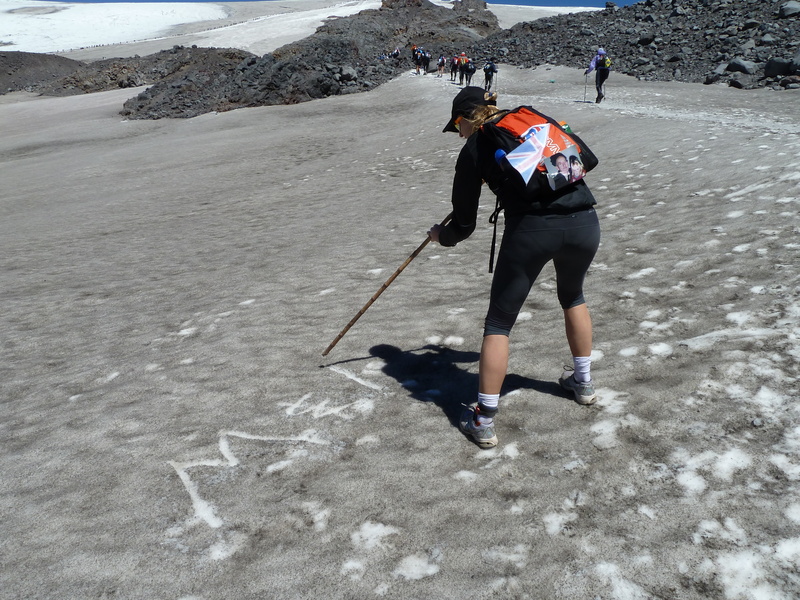 We crossed another chip sensor and began our 9 km loop around the top of the volcano. Due to the recent snowfall from the weekend before, we had fresh powder to have fun in. This meant we would sink in a few inches before having to pick up our feet to move forward. It was similar to the extra work involved in running in loose sand. As we progressed, we chatted with people that we had met before and others that were going at our pace. Laura even managed to find someone who’d been to Hunstanton, the tiny town she is from. She was in shock to find someone that knew of the place much less been there and the fact that they’d found each other while on top of a volcano in Chile. What are the odds! We passed a photographer so we had to take advantage of the opportunity as we love our jumping photos. 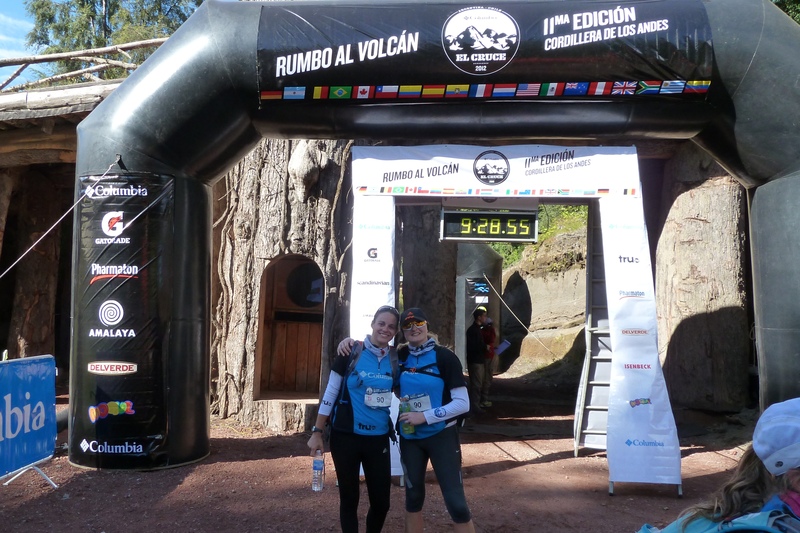 When else were we going to be 2200 meters up a volcano after running 20 km to get there? Moments like those, must be documented. Even though we were at the top and we assumed we were done with the uphill battles, we were not. After multiple times of swearing we’d done the last incline, we hit the chip sensor and the descent. We skied our way down the slippery slope with our running shoes and tried our best not to fall over. We laughed at our attempts to find the best way down and skidded from side to side as if we were really were skiing. The edge of the snow was near, but there were still kilometers ahead of us to be able to say we crossed the finish line on Day 1. 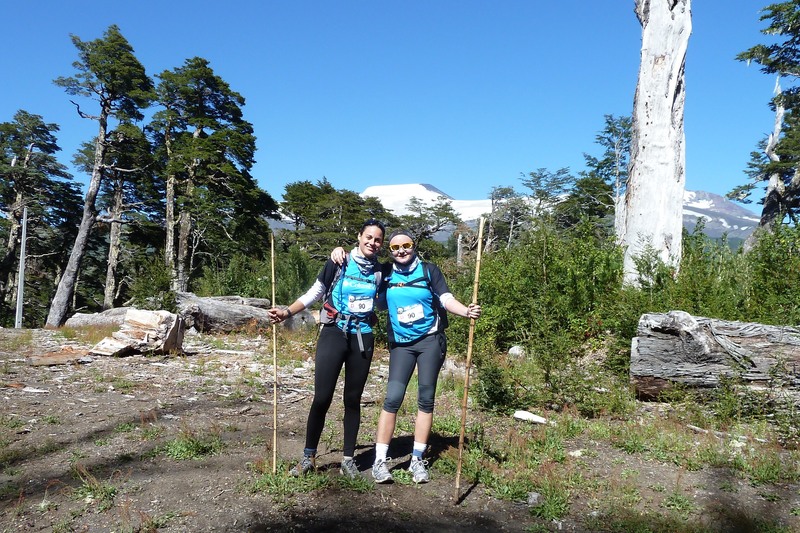 Note: Last night there was a special on ESPN Run about Cruce de los Andes. We mentioned this before, but now it’s official…we’re famous! We made the cut and even the US flag on our tent appeared. We’ll see if we can get a recording or at least the parts we’re in up here soon. 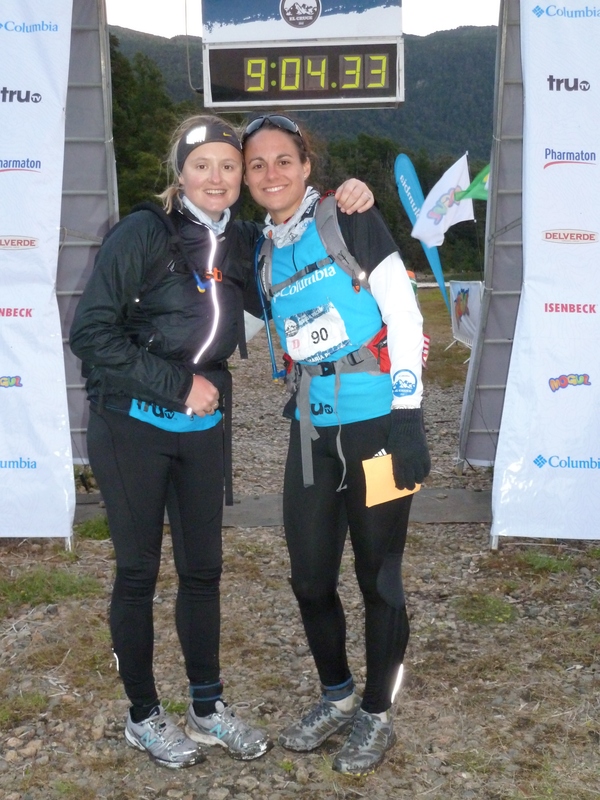 Maria and I woke up that next morning to the sounds of people zipping up running leggings, filling running packs with energy gels, brushing their teeth. “How long do these people need to get ready?” It had sounded as if they had been up for hours. Equipo 86 laughed at us as we emerged, doe-eyed to the morning. “Bird, there are some people out here with their packs on already,” I said. Well, that’s just not our style. We pulled on our running gear and set off for breakfast. Breakfast in Argentina consists of little more than a cracker or two and a bucket load of coffee. We went for neither, but had our secret ingredient: peanut butter. A whole jar of the stuff had made it with us, and we devoured tea along with bread and peanut butter. I then sat in the tent and made a huge mess while making peanut butter and lettuce (for the crunch) sandwiches with salad we’d saved from last night’s dinner. After the queue for the toilet and another last-minute toilet stop (birds will be birds), we were off. It was 2km to the starting line. The sun was already shining and there in front of us, as we walked through the village, was the volcano we were heading up. At that moment, we were at about 600m above sea level. We would go to 2200m. How this was going to be possible running, we didn’t know. It seems others had the same thoughts as some runners dived into the tiny church on their way to the starting line. 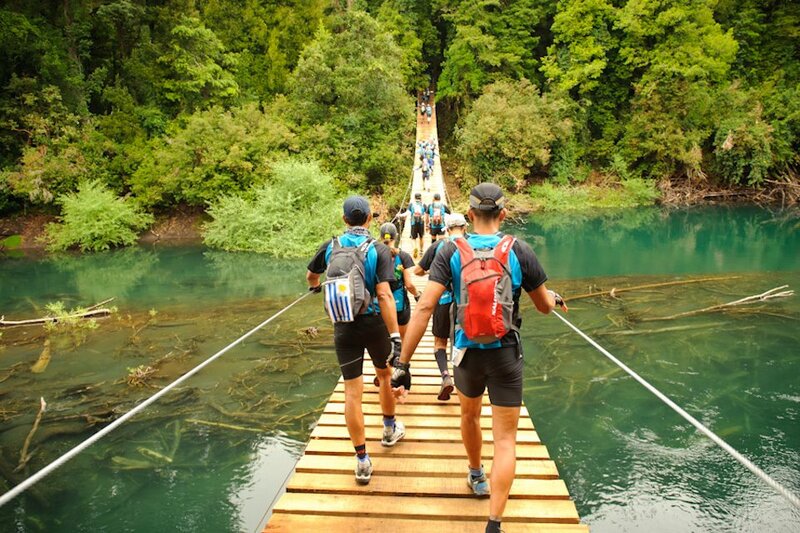 The starting line was on the other side of a bridge that the organisers had had to construct for the event. We had to wait a while in order to even get to the bridge and the chip timer at the start, as there was no room for all 1,500 of us to go over at once. There was a nervous energy in the air; calves were bouncing up and down, shoulders were being stretched. We heard the helicopter and immediately all hands went to the sky. And then we were on the other side. I hadn’t even noticed the chip until Maria shouted at me, “That’s it!” And we were off. There was a sudden jolt in the body and we bounced along through the grassy paths until, after about 50 seconds, Uh, Hill. “What, already? !” we exclaimed. Still, we knew the first half of today was going to be all about going up. The first couple of hours slowly drove us upwards, through the trees, but with spectacular views as climbed. No one was running the uphills. This was encouraging. We were with normal runners! One lady saw we were hiking without poles. “They really help,” she told us, “you should get some.” Soon, eagle-eyed Maria spotted a good bit of thick bamboo and we snapped it in half. Our walking sticks had been born out of the mountain we climbed. The further we climbed, the more the volcano revealed itself to us. It was beautiful, majestic and… far away. Still, we kept going. 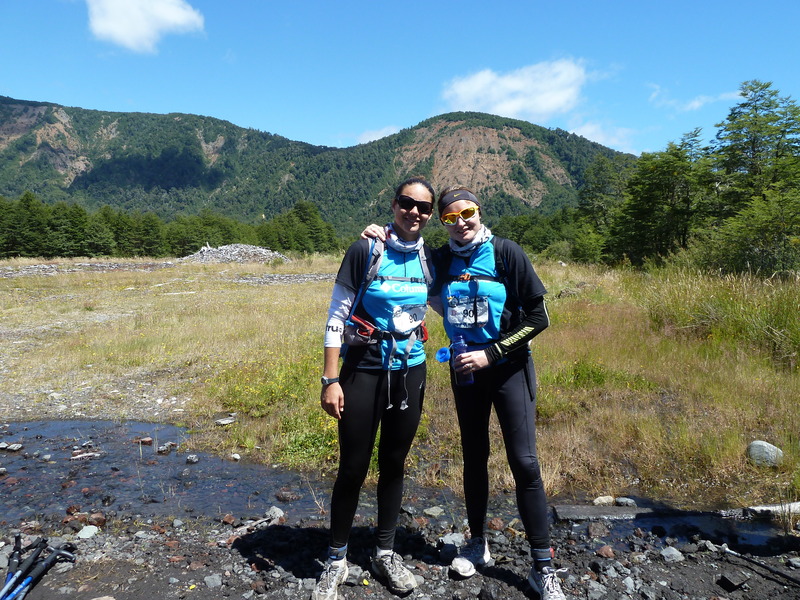 Over our shoulders to our right we could see the volcano Villarrica, and behind us sat the perfectly-coned and snow-capped volcano Lanin. We were in a special place. Above the tree line we could see the path ahead: a track of stones and rocks climbing up and up until there was a line of tiny ants in the white. The snow. We ploughed on. There were photo and Gatorade (Lucozade) stops and we chatted to those we passed and who passed us. Our friends from the previous day asked how we were. There were only three words. This. Is. Brilliant. 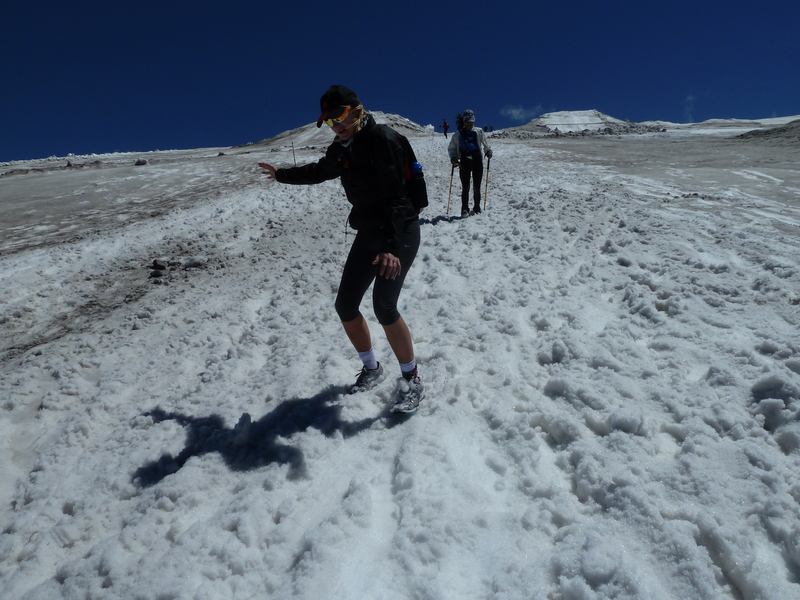 Getting to the snow line, people were stopping for lunch, a toilet break and clothing changes. I don’t know how far we had already climbed at that point, but we were going higher still and the wind was going to show its face. Time to put on another top, top up the sun cream and eat a banana. It was also time to sing. We had our sticks, we had our voices, we had each other.